I’ve talked here several times now about our passion fruit (lilikoi in Hawaiian) plant, which has been dormant recently but provided us with a bounty of delicious, sweet fruit for several months. 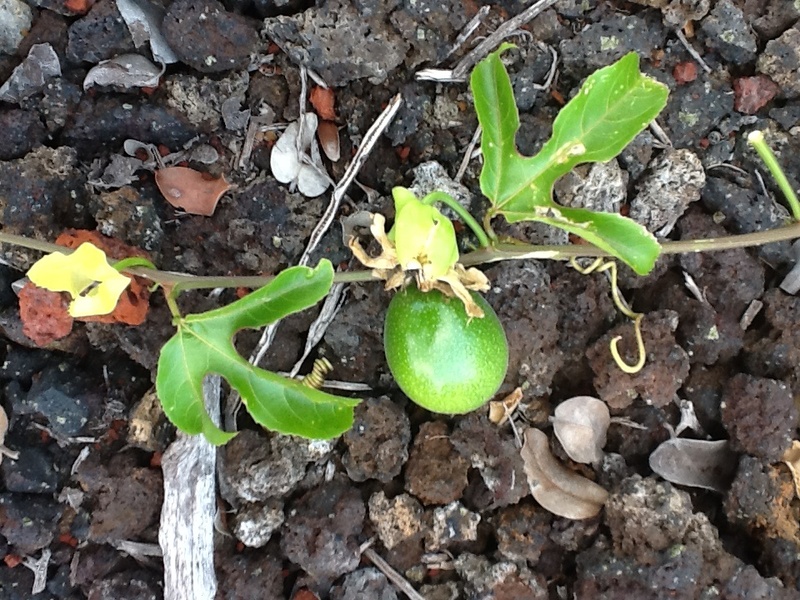 I recently discovered another interesting fruit growing on our property, and after some investigation, I discovered that this new fruit was, in fact, lilikoi, and what we thought was lilikoi is actually a kind of wild guava! The guavas grow on small trees, and are apparently regarded as a pest plant in Hawaii. It’s true, they do grow everywhere – there are plenty just in our neighborhood, and it’s not uncommon to see 20-30 guavas on the ground along the highway under a large tree pregnant with little yellow fruits. The lilikoi grow on low vines that snake along the ground. I first noticed that there was something more to these vines when two flowers showed up on one of the plants a few weeks ago. The flowers had a smell that was remarkably similar to Carmex. About a week or so later the flowers started to shrivel up, but a little green fruit emerged from the dried flowers as if they were fruit cocoons. The fruit is still not ripe, but it has been growing quickly. I am still not sure which type it will turn out to be – there are two different varieties, one with yellow skin and the other with purple skin. Stay tuned to find out!